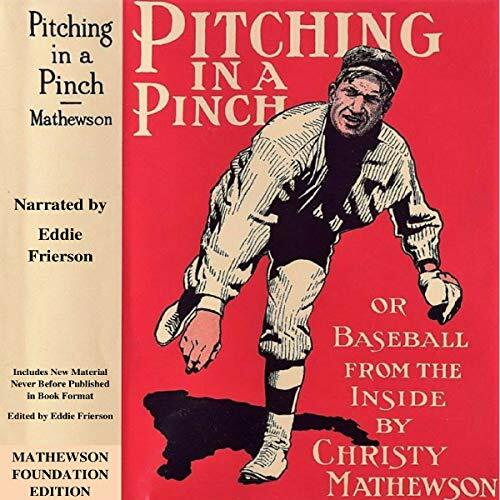 Christy Mathewson's famous work Baseball from the Inside, originally published in 1912, now presented in a brand-new edition by historian, actor, writer, and biographer Eddie Frierson with additional writings by Matty never before published in audiobook form. This is a grand piece of history experienced by one of the greatest ballplayers who has ever lived. Christy Mathewson was more than baseball during his lifetime. He was the most recognizable American across the glove (along with Teddy Roosevelt) during the first two decades of the 20th century. His insights on life and the lessons he taught continue to inspire those who discover him today. The Mathewson Foundation brings you this all-new edition and hopes to introduce you, the listener, to a new friend and fascinating man. Not only does this bring a voice to Christy Mathewson's century old baseball classic book, PITCHING IN A PINCH, this audiobook contains over 100 pages (SIX HOURS!!!!) of all new never before published in book form material written by the great Matty himself. It is fascinating and a terrific listen for anyone who loves baseball or American history. I can't wait for the other planned releases in this new Mathewson Foundation reprint series including the brand new books BATTING IN A BREAK and MANAGING IN A MOMENT. This is definitive Christy Mathewson biographical material and should not be missed by any fan of the American pastime.